Hallman Asphalt & Sealing, LLC, was founded in 1976 by Bill Hallman. Specializing in small and residential paving and seal coating, Hallman Asphalt takes pride in our ability to serve each of our client’s individual needs. 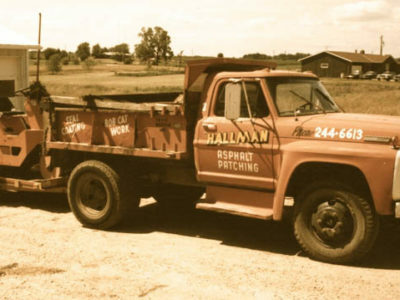 Still locally owned and operated 41 years later, Hallman Asphalt continues to prove the importance of hard work and traditional business values. We take pride in the ease of communication and direct accessibility we offer our clients. From bid request, to the day of the job, and any final questions after the paving is complete, the employees our customers interact with on the phone will be the same employees working at the site. Our direct communication model eliminates much of the errors and customer frustrations that sometimes occur at larger paving companies. Hallman Asphalt & Sealing LLC, is a small company with a very experienced crew. Several of our crew members have been with the company since our founding 41 years ago. This means that at a paving job site, our customers can expect the crew members to have at least 20 – 30 years of experience. Bill’s son Gavin has been learning the asphalt business since he was 12 years old. Gavin graduated from Madison College with a degree in Business Management. Today he leads business development at Hallman Asphalt & Sealing LLC, focused on implementing new technology to the paving process. Since our founding, Hallman Asphalt & Sealing LLC, has been committed to creating satisfied customers. Our unwavering commitment to reliable and professional service in turn, motivates our clients to recommend us to their neighbors and friends. We are confident you will be satisfied with the finished product and look forward to working with you again in the future. Dane County residents pride themselves on the great lengths they take to sustain the natural resources our community. More recently, city service departments and several local businesses in the Greater Madison Area have changed their business practices to help sustain our green community. Hallman Asphalt has been doing our part for an environmentally friendly community since founding 41 years ago. What about our business makes us so green? Additionally, Hallman Asphalt & Sealing LLC, commits to upholding strict Dane County standards for chemicals used in the seal coating process. These regulations ensure that our customers do not unintentionally contaminate the treasured natural resources Dane County residents enjoy year round.